The Rite-Size A Marineland Penguin Replacement Filter Cartridge (6-Pack) is for the Marineland Penguin BIO-Wheel Mini (75) Power Filter and Marineland Penguin BIO-Wheel 100 Power Filter. 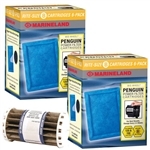 The Rite-Size A Marineland Penguin Replacement Filter Cartridge 12-Pack (two six packs) is for the Marineland Penguin BIO-Wheel Mini (75) Power Filter and Marineland Penguin BIO-Wheel 100 Power Filter. The Rite-Size A Marineland Penguin Replacement Filter Cartridge 24-Pack (four six packs) is for the Marineland Penguin BIO-Wheel Mini (75) Power Filter and Marineland Penguin BIO-Wheel 100 Power Filter. 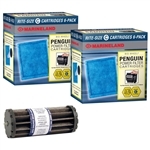 The Rite-Size A Marineland Penguin BULK Replacement Filter Cartridge (6-Pack) is for the Marineland Penguin BIO-Wheel 75 Power Filter and Marineland Penguin BIO-Wheel 100 Power Filter. We've removed the product from the packaging. Doing this lowers the shipping cost, and we pass on the savings with a lower product price. The Rite-Size B Marineland Penguin Replacement Filter Cartridge (6-Pack) is for the Marineland Penguin BIO-Wheel 150 Power Filter and the discontinued Marineland Penguin BIO-Wheel 125 Power Filter. The Rite-Size B Marineland Penguin Replacement Filter Cartridge 12-Pack (two six packs) is for the Marineland Penguin BIO-Wheel 150 Power Filter and the discontinued Marineland Penguin BIO-Wheel 125 Power Filter. The Rite-Size B Marineland Penguin Replacement Filter Cartridge 24-Pack (four six-packs) is for the Marineland Penguin BIO-Wheel 150 Power Filter and the discontinued Marineland Penguin BIO-Wheel 125 Power Filter. The Rite-Size B Marineland Penguin BULK Replacement Filter Cartridge (6-Pack) is for the Marineland Penguin BIO-Wheel 150 Power Filter and the discontinued Marineland Penguin BIO-Wheel 125 Power Filter. 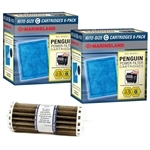 The Rite-Size B Marineland Penguin Replacement Filter Cartridge 12-Pack (two six packs) is for the Marineland Penguin BIO-Wheel 150 Power Filter and the discontinued Marineland Penguin BIO-Wheel 125 Power Filter. We also include a Marineland Penguin 150 Replacement BIO-Wheel Assembly (Part #PRBW150B). The BIO-wheel only needs to be replaced if it's physically breaking apart. The Rite-Size C Marineland Penguin Replacement Filter Cartridge (3-Pack) is for the BIO-Wheel 170 and 330 Power Filter. The Rite-Size C Marineland Penguin Replacement Filter Cartridge (6-Pack) is for the Marineland Penguin Bio-Wheel 200 Power Filter and the Marineland Penguin Bio-Wheel 350 Power Filter. It is also for the discontinued Penguin Bio-Wheel 170 & 330. The Rite-Size C Marineland Penguin BULK Replacement Filter Cartridge (6-Pack) is for the Marineland Penguin Bio-Wheel 200 Power Filter and the Marineland Penguin Bio-Wheel 350 Power Filter. It is also for the discontinued Penguin Bio-Wheel 170 & 330. The Rite-Size C Marineland Penguin Replacement Filter Cartridge 12-Pack (two six packs) is for the Marineland Penguin Bio-Wheel 200 Power Filter and the Marineland Penguin Bio-Wheel 350 Power Filter. It is also for the discontinued Penguin Bio-Wheel 170 & 330. The Rite-Size C Marineland Penguin Replacement Filter Cartridge 12-Pack (two six packs) is for the discontinued Marineland Penguin Bio-Wheel 170 Power Filter (as well as the 200, 330 & 350). We also include the Marineland Penguin 170 Replacement BIO-Wheel Assembly (Part #PR1940B, Model 170B). The BIO-wheel only needs to be replaced if it's physically breaking apart. The Rite-Size C Marineland Penguin Replacement Filter Cartridge 12-Pack (two six packs) is for the Marineland Penguin Bio-Wheel 200 Power Filter and the Marineland Penguin Bio-Wheel 350 Power Filter. It is also for the discontinued Penguin Bio-Wheel 170 & 330. We also include the Marineland Penguin 200 and 350 Replacement BIO-Wheel Assembly (Part #PRBW2350B). The BIO-wheel only needs to be replaced if it's physically breaking apart. The Rite-Size C Marineland Penguin Replacement Filter Cartridge 24-Pack (four six packs) is for the Marineland Penguin Bio-Wheel 200 Power Filter and the Marineland Penguin Bio-Wheel 350 Power Filter. It is also for the discontinued Penguin Bio-Wheel 170 & 330. The Marineland Penguin BIO-Wheel Bearings are for the Penguin BIO-Wheel Power Filter Models 125, 170 and 330 (Part #PR1910B). Marineland Penguin 100 Replacement BIO-Wheel Assembly (Part #PRBW100B). The Marineland Penguin 125 Replacement BIO-Wheel Assembly (Part # PR1935B, Model 125B). Marineland Penguin 150 Replacement BIO-Wheel Assembly (Part #PRBW150B). Marineland Penguin 170 Replacement BIO-Wheel Assembly (Part #PR1940B, Model 170B). The Marineland Penguin 200 and 350 Replacement BIO-Wheel Assembly (Part #PRBW2350B). The Marineland Penguin 330 Replacement BIO-Wheel Assembly (Part #PR1945B, Model 330B).